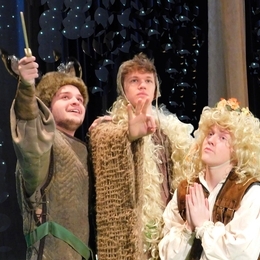 Sinclair Theatre will present one of William Shakespeare’s most popular comedies, A Midsummer Night’s Dream, February 10-18 in Blair Hall Theatre, Building 2 on the downtown Dayton campus. Adapted and directed by Nelson Sheeley, this version features music by Felix Mendelssohn including his well-known Wedding March. The four interconnecting plots, surrounding a wedding, include the adventures of four you lovers and six amateur actors who are manipulated by the fairies who inhabit the forest. Tickets cost $18 for adults and $15 for students/seniors. Performances are at 8 p.m. on Fridays and Saturdays, 2 p.m. for the Sunday, Feb. 12 matinee and 7 p.m. for the ever-popular Throwback Thursday performance on Feb. 16, where all seats are $10! Thursday and Sunday performances are American Sign Language interpreted. ALL tickets are reserved and available online now at: www.sinclair.edu/tickets. Cast includes: Theseus, Leo Santucci; Hippolyta, Courtney Kakac; Egeus, Chalres Larkowski; Lysander, Robert Hyer; Demetrius, Maximillian Santucci; Hermia, Gabriella Neuerer; Helena, Elisa Fuentes; Dancers, Thomas Puckett and Justin Lampkins; Puck, Chelsey Hall; Peaseblossom, Marley Judd; Oberon, S. Francis Livisay; Titania, Bryana Bentley; Cobweb, Nabachwa Ssensalo; Moth, Sha-Lemar Davis; Mustard Seed, Danni McClendon; Quince, Matt Lindsay; Snug,Tristan Rivera; Bottom, Jonathan Kelly; Flute, Elisha Chamberlin; Snout, Spencer Boden; Starveling, Jai-Ln Stafford; Singers, Kimberly Borst and Stephanie Voelker; and Philostrate, André Tomlinson.